"Work Hard To Get a Break"
SCIENCE FAIR, like several other real-life competition movies such as SPELLBOUND, follows several different young people who want to win the International Science and Engineering Fair. There’s tremendous jeopardy and not a dull moment in SCIENCE FAIR, which has a strong moral worldview promoting hard work, perseverance and excellence, but mitigated slightly by religious syncretism, politically correct moments and brief teenage partying. SCIENCE FAIR, like several other real-life competition movies such as SPELLBOUND, follows several different young people who want to win the International Science and Engineering Fair (ISEF). This is the Olympics of science that can propel you into the college and the job of your dreams. The movie opens by telling you that the first science fair was in 1942, and the fairs became very prestigious in the United States during the 1950s and 1960s. The movie forgets to tell you that part of that was because of the competition in the Cold War between the democracies in the West and the totalitarian regimes in the East. The movie then moves to Dupont Manual High School where Anjali Chadha is talking about winning the local science fair and wanting to win the ISEF. Anjeli has developed a means of finding arsenic in water. She is an animated young woman who comes from immigrant parents. At another high school, three boys, Ryan Folz, Harsha Paladugu, Abraham Riedel-Mishaan, are working on a remote stethoscope to use in impoverished areas of the world, such as Harsha’s homeland. At a high school in South Dakota, a young Muslim girl named Kashfia Rahman is convinced she can win the science fair. She says she comes from a high school where nobody pays attention to science, and the only mentor she can get is the football coach. Kashfia has developed a way to measure brain waves to see how people are being influenced by media. She sounds like she’s read THE MEDIA WISE FAMILY or at least MOVIEGUIDE®. We look forward to her research. In Germany, Ivo Zell is working on a single winged plane which is extraordinary in its design, altitude and flexibility. In West Virginia, Robbie Barrat is obsessed with artificial intelligence to the degree he doesn’t spend much time on his high school studies. While he’s a whiz at number theory, he’s not very good at basic math and other rudimentary subjects. In Jericho, New York, a young African-American teacher takes a group of students who are lackluster and turns them into some of the best prospects for the science fair. She has won more awards than the school has ever won. Almost all of the students are immigrants. Finally, in Brazil, Myllena Braz de Silva, who lives in a very small town in a very impoverished region, known for being the epicenter of the Zika Virus, finds a method of stopping the spread of the mosquito virus that infects the proteins that causes Zika. The girl’s mother is a maid who loves Jesus and says, “Put Jesus first.” He girl’s father is a farmhand. The third world school has two teachers who say they’re ill-equipped to teach a genius like this young lady. A couple of other children are featured in science fair, but the whole point is that the audience gets attracted to the young scientists, and then roots for their favorite to win. So, there’s tremendous jeopardy and not a dull moment. One of the best aspects of SCIENCE FAIR is that most of these children come from poor families, so they’re almost proof positive that, by design (and not by circumstances, income level or nurture), they have innate gifts that come from God. About 1700 students from 78 countries enter the fair. Also great are the mentors, especially the teacher in Jericho, NY, who teaches the children to be excellent and disciplines them with encouragement and great expectations. The Jericho students in their own categories win more awards than any other group. The big questions are: who’s going to be the main winner; and, what’s going to happen to the children we like? Some of them lose, but some of them, even though they lose, get picked up by big corporations, and some of them win. SCIENCE FAIR inserts a strong emphasis on immigration. One award winner meets President Obama. There are two parties with the teenagers dancing and drinking. Finally, there’s a few people who won in the past who say the science fair changed their lives and propelled them to greatness. The movie does make the point that America used to be first in science but is lagging behind and needs to recover its love of science if it wants to be great again. Bad study habits but rebuked and procrastination but rebuked. 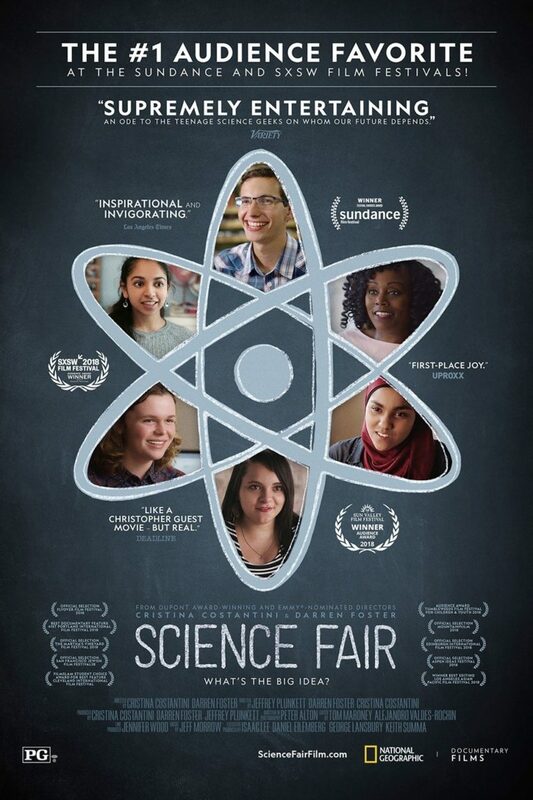 SCIENCE FAIR, like several other competition movies such as SPELLBOUND, follows several young people who want to win the International Science and Engineering Fair. The movie opens by telling viewers that the first science fair was in 1942, and the fairs became very prestigious in the United States during the 1950s and 1960s. The movie follows young competitors in several cities across America, in Germany and in Brazil. There’s tremendous jeopardy and not a dull moment in SCIENCE FAIR. Most of these students come from poor families, so they’re almost proof positive that, by design (and not by nurture), they have innate gifts from God. About 1700 students from 78 countries enter the fair. Also, great are the mentors, who teach the children to pursue excellence and work hard. The documentary features disparate religious participants including a Muslim girl, a Hindu girl, and a girl from Brazil who comes from a very Christian spiritual family, where her mother says, “Put Jesus first.” SCIENCE FAIR has a strong moral worldview, mitigated slightly by religious syncretism, politically correct moments and brief teenage partying.